Dearborn police officers removed guns and ammunition from the house of a legally licensed Dearborn arms dealer, who died of natural causes. 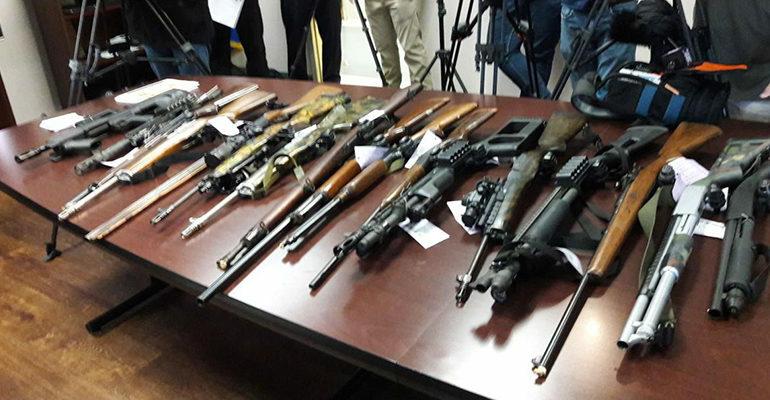 DEARBORN — Police officers found a large cache of weapons and ammo Nov. 7 after a postal carrier-initiated wellness check of a legally licensed Dearborn arms dealer, who died of natural causes. Dearborn Police Chief Ron Haddad said at a Nov. 12 press conference that the community was on edge when rumors started to spread after people saw police removing guns and ammunition from the house. “Many members of the community saw the police come out, and that’s what these weapons are here for,” he said, gesturing toward the conference room table. “The gentleman, the decedent, was a federal firearms dealers and he had a lot of weapons stored within his house. Haddad said a postal employee noticed mail and packages piling up on the porch. The employee looked in the window and saw a man lying face down on the floor. Haddad said the house was in the Springwells subdivision, northwest of Greenfield and Rotunda. He said 22 guns were removed from the house. Haddad said the amount of guns and ammo in the house was not unusual.